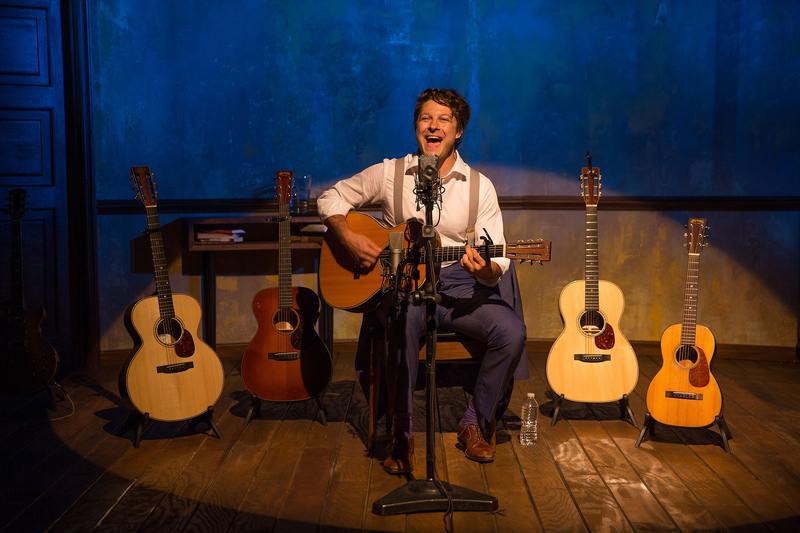 Benjamin Scheuer in “The Lion” at the Manhattan Theatre Club in 2014. Photo by Matthew Murphy. LOWELL – The traveling troubadour has arrived in Lowell, and soon he’ll be off to see the world. The Merrimack Repertory Theatrre’s production of Benjamin Scheuer’s “The Lion,” now at the Nancy Donahue Theatre through Sept. 20, is close to the heart of new MRT Artistic Director Sean Daniels, who chose it as his first piece to both present and direct at the MRT. It’s a piece he helped Schuerer develop, and helped shepherd to an acclaimed run off-Broadway that included the 2015 Drama Desk Award for Outstanding Solo Performance. Now “The Lion” is being produced at MRT before embarking on a two-year tour. Scheuer uses six guitars during the performance in the tradition of the troubadour, with poetry or verse – or in this case stories — put to music. 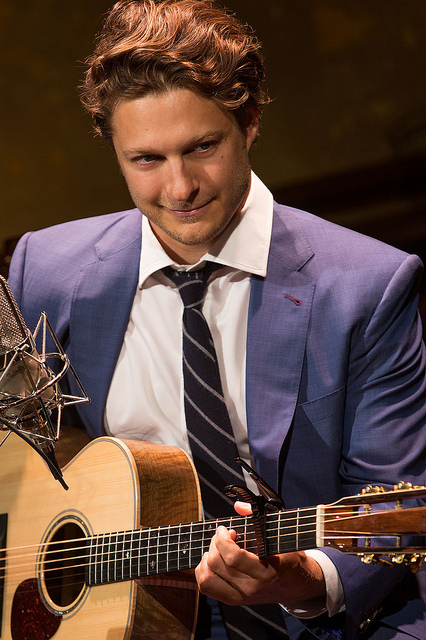 There are stories melded to each of the guitars and to different phases of Scheuer’s life, which is rather eventful for a performer who is still a young man. But whatever happened to Ben along the way, always there was the music – the music that soothed his soul and helped him find himself when it appeared all was lost. Perhaps the catchiest tune – and one which he reprised in his encore at a recent performance – is “Cookie-tin Banjo,” an ode to the beloved toy made out of a cookie-tin lid and rubber band strings his father Rick assembled for him when Ben was just two and obsessed with his father’s guitar. When he was four, his father got him got me a ukulele and then a little guitar and Ben had a burning desire to play like his father, who would sing to his three sons songs filled with life lessons. When Ben was 14, his father exploded in anger at a bad math mark, throwing an object at him and banning him from a school band trip. They didn’t speak for a week. It was only much later that Ben would find there was more to his father’s behavior than a bad temper. His father suddenly became ill, and before Ben had a chance to mend fences, there was a trip with the band and he returned to find his father gone. The stories of his father’s “sainthood” conflicted with personal experiences of the man with an increasingly quick temper, who often expressed disappointment and bewilderment at the failings of his son. After high school in England, his mother’s birthplace – where he ran afoul of a teacher named Mr. Puddifoot (his real name) – he returned home to NYC as part of his “rock god” phase, an infatuation with amplified music instead of the acoustic variety. A chance encounter inspires “I Bet Loving You Will Be Easy,” an ode to girlfriend Julia, a relationship that peaks and spikes and eventually implodes, and soon will be replaced by a crisis even larger in scope – a life-threatening disease. Kudos to Ben Stanton’s effective lighting, including the ring of bare bulbs which changes to mark abrupt changes in the mood and tone of the piece. “The Lion,” which rings in at a brisk 80 minutes, is a series of small pleasures wrought by an accomplished singer/songwriter and his plethora of stringed accompanists. Daniels’ fingerprints, Schueer admits, are all over it, helping mold it into a cohesive, dramatic piece. Scheuer and Daniels ask that you take the time to listen to what is an emotional, powerful, funny, heartbreaking, and ultimately redemptive tale of one man’s journey. And that’s a lot to say, even with six guitars. The Merrimack Repertory Theatre production of “The Lion.” Written and performed by Benjamin Scheurer. Directed by Sean Daniels. Scenic design by Neil Patel. Lighting design by Ben Stanton Sound design by Leon Rothenberg. At the Nancy Donahue Theatre at Lowell Memorial Auditorium through Sept. 20. www.mrt.org.